The Poetry Machine was developed in 2012 as a way for libraries to exhibit electronic literature.52 The installation consists of three sensor-equipped books through which (up to) three simultaneous users can compose poems on a screen, and then get them printed on small receipts and stored on a website. When seizing a book, the user is assigned a sentence from this book out of approximately a hundred different sentences. Each sentence exists in three variations, which the user can choose to drag into the writing space. After a limit (e.g., 350 characters) is reached, by combining the books and sentences, the poem is finished, printed, and stored online. The Poetry Machine was designed as a collaborative project between librarians, authors, and researchers, and the design has focused on critically addressing the digiti- zation of literary culture—that is, on the tendency of the literary apparatus. 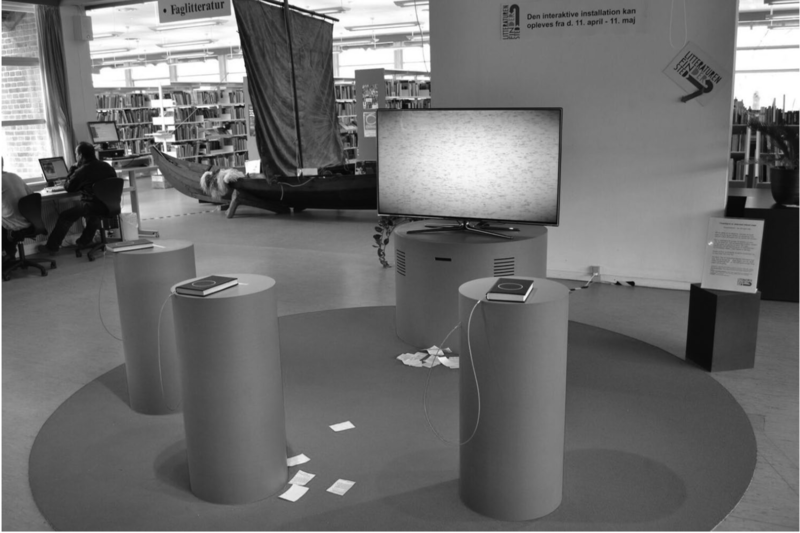 The Poetry Machine allows users to experience digitization through the composition of poems and interaction with the installation. In this way the installation seeks to make the apparatus of digitization sensible. Apart from making a usable and meaningful literary installation, it proposes that digitization does not just make the book disappear into virtual libraries but instead on a more fundamental level changes writing itself. Furthermore, it suggests a tactic to comprehend and act against the disappearance (“burning”) of the book that has happened at many libraries. As not-just-art, it explores how tactics from electronic literature challenge traditional literary understanding through three interconnected levels.